Let’s talk about dead grammar. There are plenty of rules for grammar which aren’t true any more. Heck, I before E actually has more words which break the rule than words that follow it. Zombie Rules, so called because they are dead but still lifelessly wander the earth looking for writers to scare off, are both helpful and a hindrance. The zombie rules were important when you were learning to write. They helped you to write clearish sentences in elememtary school and they’ve guided a majority of your writing since then. But you can ignore them. Tell you what — let’s go to the grammatical diner together. We’ll split something. Have you ever had an infinitive? They say not to split it but it’s just too much for me alone. Aren’t I hilarious? No…? 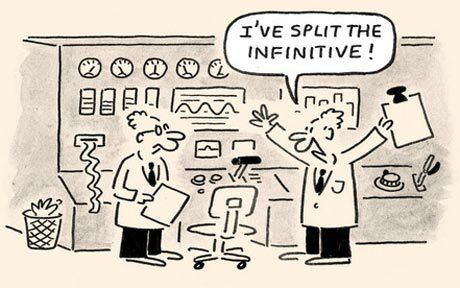 Well… at any rate… not splitting infinitives is just asking to get a splitting headache. Let’s think about it like this: In order to adequately assess if we should remove a modifier from an infinitive we have to fully understand what it will do to the sentence. 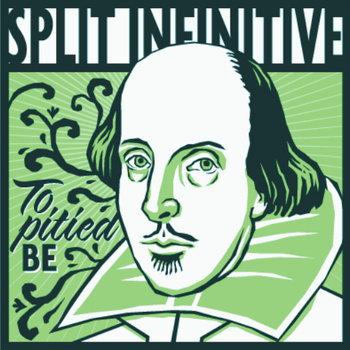 How awkard would that sentence sound without the split infinitives? Would we be able to asses adequately that which we tried to understand fully? Would I sound like a pompous tool? Verily. 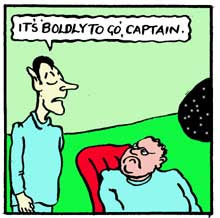 The statement wouldn’t be nearly as powerful if man “went boldly” where no man has gone before. That’s much clearer now isn’t it?